Time to brush off your dancing shoes and join the East Haddam DTC on March 2nd to celebrate Mardi Gras New Orleans Style! We'll be serving jambalaya and muffuletta and The East Haddam All Star Band will provide the music. Tickets available from members, or email karancan@yahoo.com. $25 in advance and $30 at the door. • "Like" @bluewavefest on Facebook! We're excited to be participating in the 5th Annual Celebrate East Haddam Event, hosted by the East Haddam Business Association. A premier annual Spring event to bring East Haddam and surrounding areas together for an outdoor festival of businesses and organizations showcasing their products, services and upcoming events. Join US for lots of fun with a LIVE BAND, CAJUN FOOD & BYOB! Your ticket covers admission, a delightful dinner of New Orleans food and live music! Click here to purchase tickets, or send us an email at easthaddamdemocrats@gmail.com, or call 860-817-3115! at the East Haddam Grange Hall, 488 Town Street, East Haddam, CT 06423 to endorse candidates for the Democratic Town Committee and to transact other business as may be proper to come before said caucus. Dated at East Haddam, Connecticut, on the 9th day of January 2018. Come hang out for Democracy & Dogs with the East Haddam Democrats on Sunday, October 22nd at 1pm at Captain Comer Memorial Park. 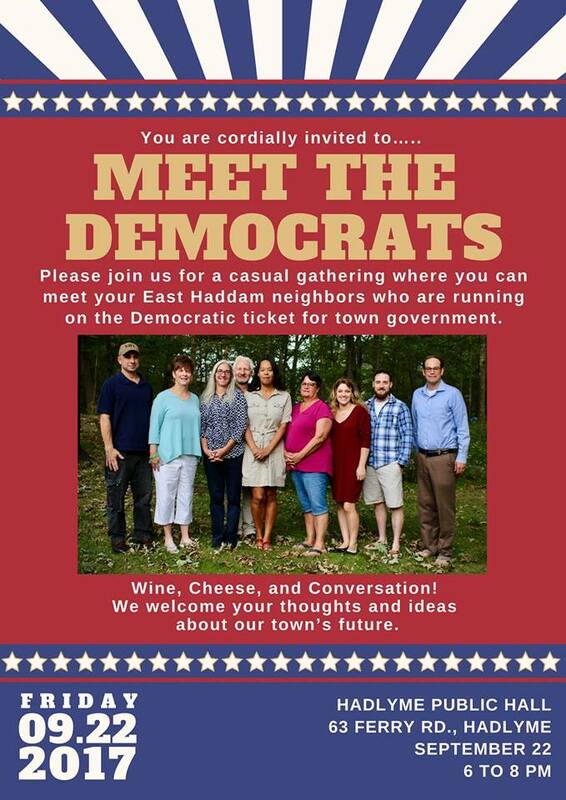 A fun, kid friendly afternoon for a casual gathering where you can meet your East Haddam neighbors who are running on the Democratic ticket for town government. The East Haddam Democrats will host CT Democratic Gubernatorial Candidate and current Mayor of Middletown Dan Drew and his running mate, Liz Linehan, at their monthly meeting on October 16, at 7 pm, at the Old Town Hall in East Haddam. Voters are invited to a candidates’ forum at 7 p.m. Thursday, October 12, at Nathan Hale-Ray High School auditorium. The forum is sponsored by the East Haddam News, which has invited the candidates for first selectman to participate and answer a series of questions on important town issues.